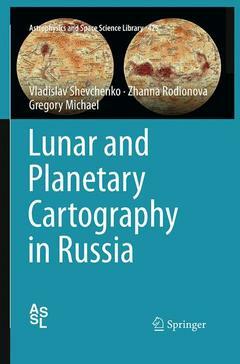 This book is the first to document in depth the history of lunar and planetary cartography in Russia. The first map of the far side of the Moon was made with the participation of Lomonosov Moscow University (Sternberg Astronomical Institute, MSU) in 1960. The developed mapping technologies were then used in preparing the ?Complete Map of the Moon? in 1967 as well as other maps and globes. Over the years, various maps of Mars have emerged from the special course ?Mapping of extraterrestrial objects? in the MSU Geography Department, including the hypsometric map of Mars at a scale of 1:26,000,000, compiled by J.A. Ilyukhina and published in 2004 in an edition of 5,000 copies. A more detailed version of this map has since been produced with a new hypsometric scale. In addition, maps of the northern and southern hemispheres of Mars have been compiled for the hypsometric globe of Mars. Relief maps of Venus were made in 2008, 2010, and 2011, and hypsometric maps of Phobos and Deimos at a scale of 1:60,000 were published in 2011. History of Lunar and Planetary Cartography in Russia provides detailed information on the compilation of this diverse range of maps and will be of interest to all lunar and planetary cartographers. From the Contents: Introduction.- Luna 3 - the first map of the far side of the Moon.- Dr. Yu. Lipskiy and his method of deciphering of the Luna 3 pictures.- The First Atlas of the Far side of the Moon.- The First Globe of the Moon 1:13 60 000. Vladislav V. Shevchenko is Head of the Department of Lunar and Planetary Research at Sternberg State Astronomical Institute, Moscow University. He has held this position since 1978, and throughout that period he has also been Chairman of the Lunar Task Group of the International Astronomical Union's Working Group for Planetary System Nomenclature. From 1978 to 1997 Dr. Shevchenko was Chairman of the Lunar and Mercury Working Group of the Astronomical Council, Russian Academy of Sciences. He also served as a member of the Task Committee on Lunar Base Structures of the American Society of Civil Engineers (1991-5) and a member of International Design for Extreme Environment Association (IDEEA) (1989-93). He is a past editorial board member of Solar System Research and The Earth and the Universe (both periodicals of the Russian Academy of Sciences). Zhanna F. Rodionova works in the Department of Lunar and Planetary Research at Sternberg State Astronomical Institute, Moscow University. She is an active member of the International Astronomical Union, being a member of Division F Planetary Systems and Bioastronomy and Division F Commission 16 Physical Study of Planets & Satellites as well as a past member of Division III Planetary Systems Sciences. Her publications include works on morphological cataloguing of the craters of the Moon and Mars and hypsometric mapping. Together with J.A. Brekhovskikh she compiled the new Hypsometric Globe of Mars based on laser altimeter data of the Mars Global Surveyor spacecraft. Gregory Michael is a planetary scientist at the Free University of Berlin. He is a co-investigator of the Mars Express High Resolution Stereo Camera, and specialises in the dating of planetary surfaces from the analysis of their impact crater populations. A former member of the Department of Lunar and Planetary Research, he was the first western student to earn a PhD at the Sternberg Astronomical Institute.